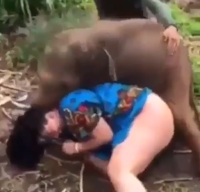 Saturday, April 13, 2019- This video of a female tourist goofing around with a baby elephant is going viral on social media. The lady was cuddling the baby elephant but the animal seemed to enjoy her company so much that it didn’t want to let go. However, things went south pretty fast after the baby elephant became aggressive leaving the lady shocked. Some people play too much.